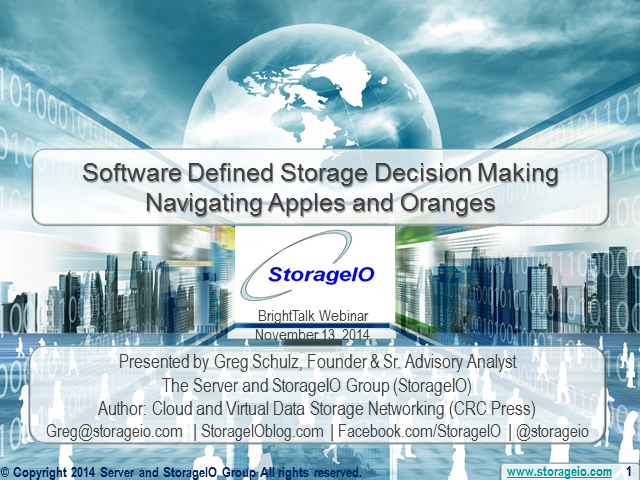 There are many different facets of software-defined storage along with software defined storage management. However, which is right for you and your environment? The answer is that it will depend on what you are trying to do or accomplish as well as your view or perception and preference of what is or is not software defined storage. This webinar looks at current and emerging industry trends perspectives for software-defined storage spanning cloud, virtual and traditional environments across various applications. A wealth of information and insight into what the industry is doing as well as what IT organizations can do today and in the future for making informed storage decisions. How can you make informed decisions without timely insight and awareness into how resources are being used or performing? Without insight and awareness into your server and storage I/O environment, you are flying blind. This webinar looks at the various issues as well as associated tools, techniques, technologies and metrics for gaining insight into your server and storage environment including storage I/O. As part of this discussion, we will also look at metrics that matter, baseline to compare what is normal vs. abnormal along with for planning and forecasting. How will your servers network and communicate with your storage on a local or remote basis including across virtual and cloud? This industry trends and perspective webinar looks at current and emerging issues, trends and tips for making informed decisions to network with your servers and storage. There are many different options for local and remote, not to mention ways of accessing storage from block, file and object. Which is the best for your environment will depend on your needs, requirements, budget and other considerations. In this session we will look at what are your options as well as tips on what to use when, where, why and how for various environments. Servers need and storage and storage support servers as part of providing information services across different organizations, application and environments. An industry trend is a shift for some environments from separate compute servers and storage I/O networking capabilities to converged environments including cloud and virtual. This webinar looks at various current and emerging industry trends along with perspectives for making informed decisions pertaining to virtual servers and storage across converged, hyper-converged and traditional deployment scenarios. You cannot go forward after something happens to your applications if you cannot go back to a point in time where your data was still intact. Likewise, if you cannot go back in time to a good copy or version of your data, how can your organization go forward? Now is the time to start rethinking your strategy and vision of how your business, applications and data should be protected so that you can evolve from how to backup/restore, business continuance (BC) and disaster recovery (DR) have been done in the past. It is time to start using new and old things in new ways which also means rethinking when, where, why ad how data is protected as part of modernizing data protection to enable business resiliency. This means moving beyond simply rethinking how or when to do backups, rather, revisit the business fundamentals and threat risks then aligning the applicable tools, technologies, techniques and best practices. With so many conversations taking place with the theme of software defined including data centers, something that is missing is the discussion about management. What about software defined data center management, or software defined server management, software defined storage management or software defined network management? What about the role of software defining? This means not just the hardware, how about the software to create valueware while enabling Data Center Infrastructure Management (DCIM), IT Service Management (ITSM) along with other related themes? This webinar looks at various data center industry trends spanning from the facilities to the technologies that reside in those habitats along with the role of effective software defined or enabled management. After all, shouldn’t a software defined data center be the place of convergence between hardware, software, valueware and peopleware? Key to making effective cloud storage decisions involves being informed as to your options, understanding your needs vs. wants. This session looks at the industry landscape of various types for cloud storage from public services to private and hybrid. Other topics that will be covered include different types of cloud storage options from deep cold arching to high performant SSD to database and application centric options. In addition to cloud servers, we will also look at technologies and tools you can deploy into your own environment. Clouds are in your future, but the questions when, why, where and how still remain. The cloud comes in many different shapes and sizes, but what does this mean for you and how can it adapt to your unique environment? This session looks at both how you can adapt your environment to use or leverage cloud technology, as well as how clouds can be used to coexist with what you already have. Converged storage means different things to various people, not to mention for some it is a new perhaps revolutionary topic while for others it might invoke a DejaVu moment. This industry trends and perspective session looks at the current landscape pertaining to converged storage and storage convergence including what’s causing the demand, issues and challenges to address, not to mention opportunities. In addition, we look at some various options as well as considerations for converged storage decision making across different environments. What is your focus for data center convergence? From cloud, virtual, software defined and legacy across software, hardware, people and value ware along with facilities, there are many different facets to data center convergence. Depending on your objectives there are many different options and considerations we will explore. This industry trends perspective webinar looks at issues, challenges, and opportunities pertaining to data center convergence. How resilient is your data infrastructure? Your data infrastructure are collection of hardware, software, people, processes, procedures, value ware along with physical facilities that combine to support your business and information infrastructure needs. With so many different pieces, your resiliency is the sum of all the parts working together and able to isolate and contain faults to guard against the weakest link. However, what is your protecting for or against, what are the applicable threat risk scenarios and how to stretch your budget further without comprise. These among other themes are what we will cover in this industry trends perspective webinar along with various tips and decision-making considerations. There are different aspects of networking ranging from physical cable (copper or optical) along with radio frequency (RF) or wireless mediums; however, there are also the software and logical considerations among others. In this webinar, we are going to look at how your servers and storage can network or communicate with each other. In order for servers to communicate with storage and vice versa on a local or remote basis. There is a mix of server, storage, networking hardware and software considerations to address. This discussion looks at what those considerations are as well as networking between different skills or knowledge groups to help network pro’s know a bit more about storage and vice versa across local, virtual and cloud servers and storage. What are you optimizing for? There are various ways to optimize virtual serve and storage environments to achieve different results depending on what your objectives are. There are plenty of tools, technologies, tips, products, solutions, service, best practices and rules of thumb that can be used in the virtualization management toolbox. However how do you know which approach is best for a given situation, or are you simply flying blind pushing buttons, turning knobs and pulling levers to see what happens. This webinar looks at some of the reasons for optimizing a virtual environment spanning Performance, Availability, Capacity and Economics including from applications through software and hardware. Some say virtual storage, others say storage virtualization, yet others will say storage HYPErvisors and more recently we have software defined storage. However, what about software defined storage management and using virtual storage or storage virtualization for managing storage resources and enabling data infrastructures along with the associated business applications, they support? Some of these solutions are vendor propriety hardware or software that supports third party technologies while others are open source based. Likewise, they have different usage scenarios and technical capabilities leading sometimes to apples to oranges comparisons. This webinar looks at the current industry landscape exploring the many different facets of virtual storage, storage virtualization, software defined storage and software defined storage management. Enterprise storage is alive and well, however there are many changes occurring both in technology along with usage and applications scenarios. There are many different application and workload usage scenarios with various performance, availability, capacity and economic considerations, likewise there are various technology options. These options range from local on-site traditional enterprise-class storage systems to mid-range along with software defined across commodity and vendor proprietary hardware. Some of these solutions are evolution, some may even be revolutionary, however they all fit into supporting technolutionary enterprise storage needs. This webinar will look at the current landscape options for enterprise storage along with what to use when or where for different applications requirements. To some, open source cloud computing and storage are inclusive, yet to others they can be exclusive of each other used for separate purposes. Likewise, some open source and cloud technologies, solutions and services are marketed as business enablers, yet are there technology concerns to be considered? On the other hand, the focus can be on the technology as an enabler, yet does it address business needs and concerns or become a barrier. The key to leveraging open source and cloud technologies is realizing what to use when, where, why and how, not to mention in new ways vs. simply as a replacement for doing things how they have been done in the past. Big data is more than a big buzzword that by its name implies a need for data storage. A challenge with big data however are the many difference faces or facets of big data from Hadoop analytics and the Hadoop Distributed File System (HDFS) to data warehouse, to large scale untinctured NAS supporting video, audio and other very big fast data. Then there are the Meta data needs including NOSQL and SQL key values that have similar characteristics to traditional little data. What is the role of block, file and object storage as well as virtual and cloud storage? Does big data need to be backed-up or protected? This webinar looks at the many facets of big data as well as the storage options and decision making to protect, preserve and serve these new and existing applications in cost effective ways. Key performance indicators (KPI) enable organizations to manage their factories, distribution centers, supply chain and other aspects of your business operations in a cost effective manner. This means having metrics that matter covering not only utilization of assets, material consumption and production output. In addition, this means having insight into defects, re-work, lost time due to delays or lost opportunity. IT Data Centers are Information Factories that also need to be monitored for different purposes as well as from various facets and context to have timely insight for effective decision-making. Monitoring ranges from physical facilities or the habitats for technology to the technology and tools that live there (servers, storage, networking, hardware, software) to deliver information services. This webinar looks at how to avoid flying blind gaining situational awareness and timely data center insight monitoring a key enabler for data center infrastructure management (DCIM). Topics that we will discuss include metrics that matter, service level objectives (SLOs), DCIM, PMDB, performance, availability (reliability, accessibility, and durability), capacity, energy and economics (PACEE), cloud, virtualization, sustainability among others. •Do you know what your costs to deliver a given level of service are? Regardless of if yours is a cloud, virtual or physical data infrastructure environment, your server and storage need to network with each other. Granted this can range from local dedicated direct attached storage (DAS) to remote wide area and cloud storage with various types of block, file and object access using different shared or networked approaches. Which is right for your different needs will depend on many factors, as one size does not fit all scenarios. This is why there are many different types of server and storage I/O access and interface options that will be covered in this webinar. In addition to what are your options, we will also look at what to use when, where, why along with the tradeoffs for networking your servers with storage.